with a platelet count of 34 that is falling and clear signs of infection! I’m sitting in a consulting room in The Royal Gwent Hospital where I arrived at just after 20:00hrs. yesterday and it is now about 05:30hrs. and in a disgusting display of utter incompetence of the management structure of The NHS under the devolved irresponsibility of the super annuated Welsh Council they STILL have failed to find a bed for me! In view of the circumstances and the state of my health how do YOU feel about the chair I spent the night in! I was unable to sleep past 09:30hrs. on the 06-May02011 after about 4.1/2hrs. sleep so that is over 20hrs. without sleep so far and so far one coffee, no food and iced water from the cooler in reception since about18:00hrs. 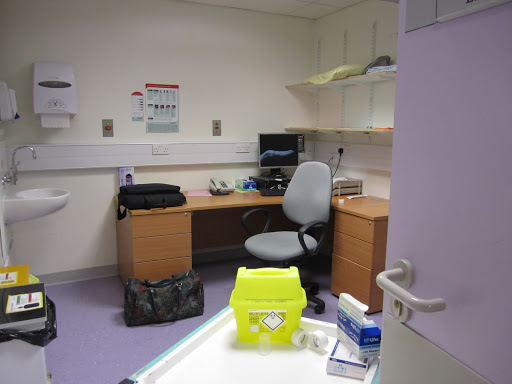 Did I tell you I’m here ‘cos I’m not well and my Consultant’s team believes I need prompt and competent attention – perhaps someone can tell me how this level of abuse by the management of the NHS can be other than damaging to my health and possibilities of survival? 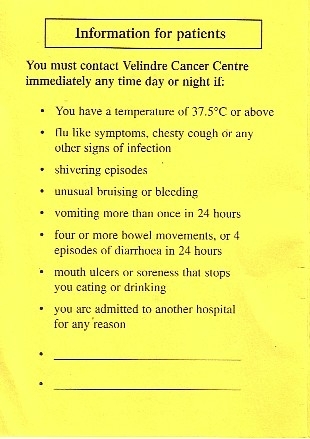 So in boredome lets consider The Velindre NHS Trust YELLOW CARD! nurse with the chemotherapy pager. 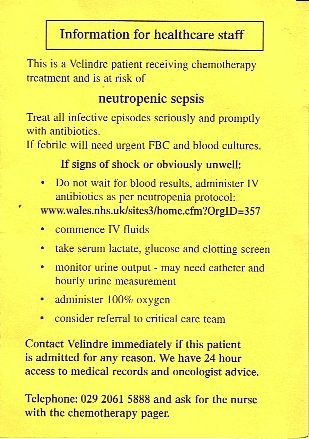 If febrile will need urgent FBC and blood cultures. access to medical records and oncologist advice. 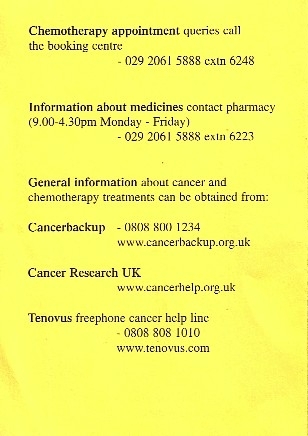 this page is not very relevant as it is just contact addresses that Velindre Cytotoxic chemotherapy patients might need! No bed no antibiotics and I’ve just had a chat with one of the nursing staff and voiced my concern just think what The Yellow Card says! Last Monday I came in and YES I had a very minor infection but a judgement was taken that my bloods were OK to cope with this but to keep an eye on it at home and monitor my temperature. Clearly SOMETHING was going wrong sufficient for Velindre to require hands on checking and care – my platlet counts are down to 34 when norm is 150 to 300 – I have clear signs of infection showing in the blood and a Consultant on the phone is happy to let my infection rise and do nothing until after more bloods sometime in the future without checking with Velindre, without clear explanation and without seeing me! This does look like crass irresponsibility and at this stage I may well take some very serious convincing that this is NOT utter irresponsibility. 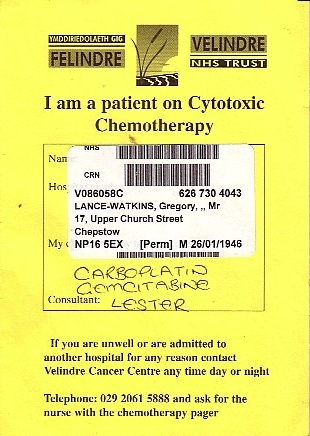 This entry was posted in Cancer, Carboplatin, chemotherapy, Cough, CYTOTOXIC, Gemcitabine, Royal Gwent Hospital. Bookmark the permalink. ← 07-May-2011 – 02:30hrs. MAU NEWPORT! Well I’ve Seen The Doctor!